Within the fictional world of James Bond to become a double 0 agent and receive your Licence to Kill, you have to kill two people. This has some worrying consequences, for a start, does this mean that serial killers are allowed to go on killing after their second murder? Secondly, in between the wannabe double 0s first and second kill they are technically a wanted murderer. What if they get arrested before they get to the second kill? Also, if a licence carrying agent gets annoyed with someone in the street they are legally licensed to kill them, it would be a shame if a spy killed someone just because they were having a bad day. And do people within James Bonds world call the police to report an "unlicensed killing"? By the way, this is what I imagine a Licence to Kill looks like. 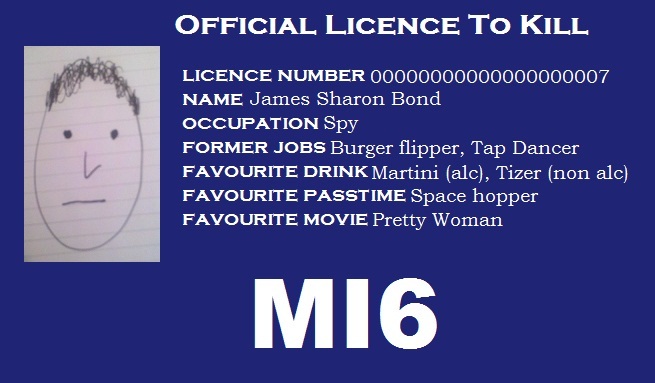 If you own a Licence to Kill you probably have to carry it with you when you want to kill. It's no good saying "No really, I am allowed to kill people, I just left my licence at home".